In the spirit of Saint Mary MacKillop, Mary MacKillop Today’s focus is on building dignity through education, health, financial inclusion and livelihoods. By partnering with local communities, organisations and groups, we bring dignity to thousands of children, women and families in Australia and throughout the world. Mary MacKillop Today works with the poorest communities in Australia and internationally, in Timor-Leste,Peru, Papua New Guinea, and Fiji to support and empower local communities. In the spirit of Saint Mary MacKillop, Mary MacKillop Today’s focus is on building dignity through education, health, financial inclusion and livelihoods. Having a valid Will is important to help protect the future of your loved ones. 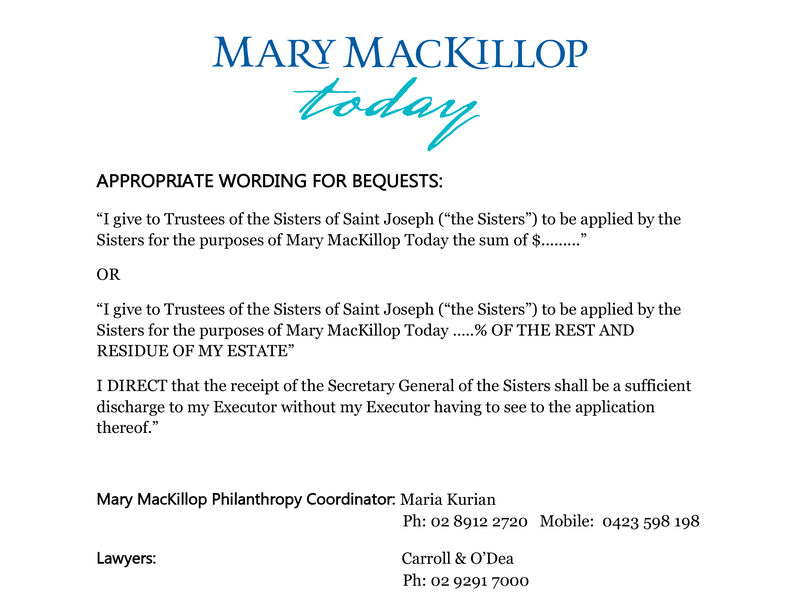 After considering your family’s needs, choosing to leave a lasting legacy to the works of Mary MacKillop Today will allow our life-changing works in education, health, financial inclusion and livelihoods to continue for years to come. 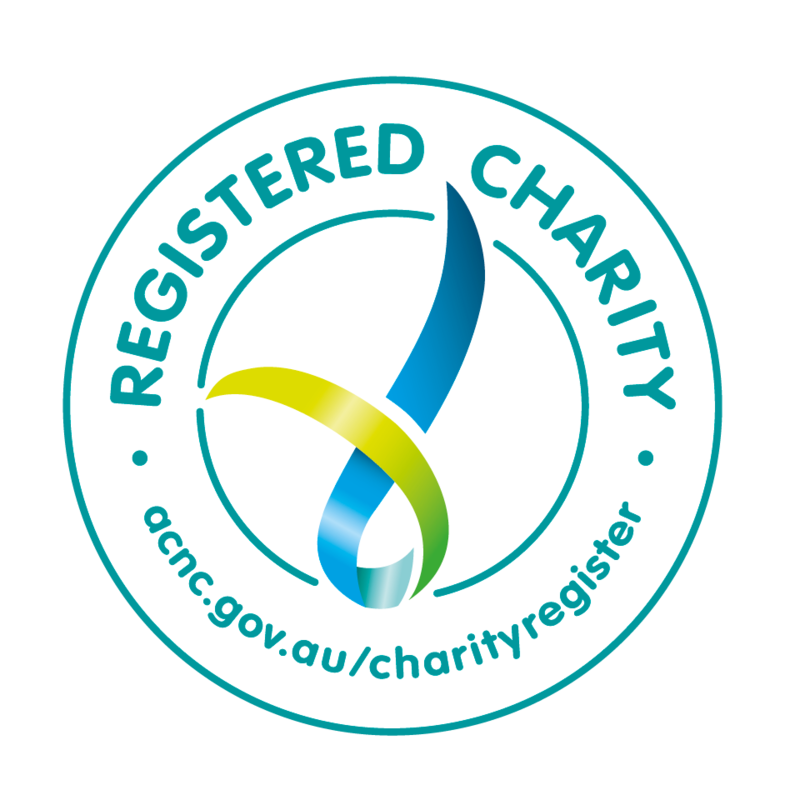 Your generosity could make a difference to the lives of many people both in Australia and beyond. Residual of your estate – you can choose to leave the remainder of your estate, once you have provided for your loved ones. Percentage of your estate – you can choose to leave a share of your estate. Specified gift – you can choose to give a gift of a specific amount of money. Specified property or possessions – you can choose to give real estate or other assets of value. You have the power to empower communities the world over. 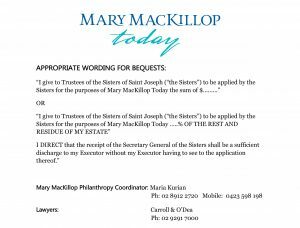 Together, in the spirit of Mary MacKillop, we can create generational change for women, men and children, through education, health, financial inclusion, and livelihoods. Every gift you give to Mary MacKillop Today helps to transform communities… One life at a time.All donations of $2 or more are tax deductible. Become an Independent Spirit by joining Mary MacKillop Today’s regular giving program and create life changing transformations for thousands of children, families and communities both in Australia and beyond. From as little as just $20 or $30 a month you can make a huge difference by supporting the most vulnerable communities through improving the quality of education, health, financial inclusion and livelihoods. Regular giving allows Mary MacKillop Today to plan our programs from year-to-year and significantly reduces our overheads, ensuring more resources are available to children, families and communities we support. Together we can bring hope to ‘the poorest and most neglected parts of God’s vineyard’ for generations to come.